Get my cookbook, ATFT-AppSnax to efficiently deal with those holiday parties! Here are delicious and easy appetizer and snack recipes for your party, someone else’s party, the office event, or just because you deserve something good to eat. It even has a section for no-cook/no-bake recipes. 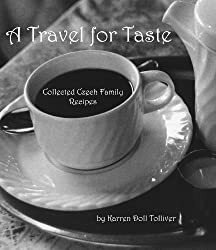 This book makes a wonderful gift for the cook on your gift list! Continuing the blog’s feature: Throwback Tuesday Post (TBTP)! This post was originally published on December 17, 2014, and updated on December 4, 2018. This week the charming, cozy Christmas market atmosphere was interrupted again, for about the 500th year in a row, by the not-so-charming-and-cozy companions of St. Nickolaus. I told you in last week’s post that ole Nick doesn’t like to do the dirty work of pointing out the naughty ones from the nice, so he travels with others who do that job. 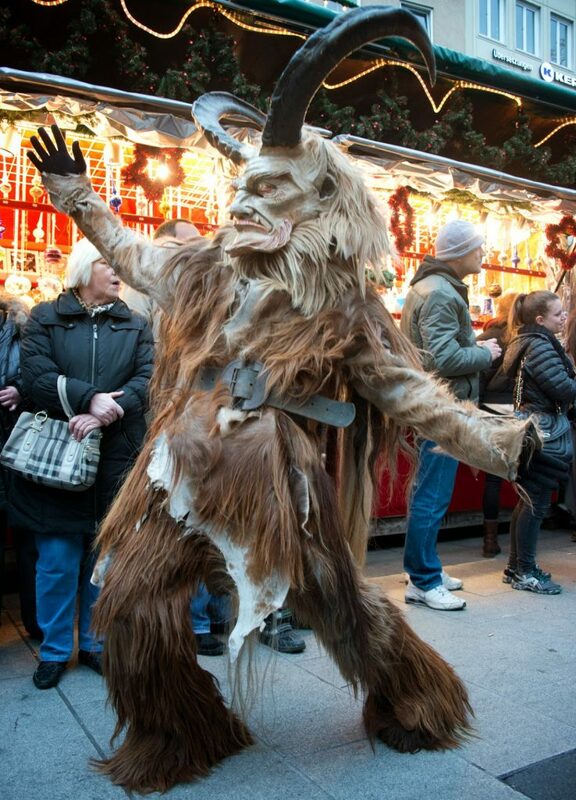 In Munich’s case, and in many villages in southern Bavaria and the Alps, his companions are the Krampus. Many Krampus clubs exist whose sole purpose is to dress up like scary demons and run around the Christmas markets whipping people with horsehair whips or bundles of sticks. On the appointed day at the appointed hour, they gather for a very long parade that makes its very noisy way through the Christmas market and surrounding area. There are 28 clubs in this year’s procession. Each club has a couple of sign-bearers in front and five to ten Krampus following. That’s a couple hundred monsters taking swipes at bystanders, growling and roaring, and tousling lots of heads of hair. Some carry children or young women away – only to return them gently to the ground a few steps from where they stood. A couple of hours before the procession, there is a children’s program in the courthouse to teach kids that a Krampus isn’t really a devil. They get to see the people without the masks and talk to them and ask questions. In fact, my husband and I saw all the performers walking from the courthouse program to wherever they start the parade. It was there we got a full dose of how loud and obnoxious the noise was. But most of them were carrying their masks under their arms, so the fright factor was mitigated. I still think the St. Nick on the Christmas Tram was the real one. I’m pretty sure these were only helpers. The crowd didn’t seem too upset about the attention from the Krampuses/Krampii or whatever the plural of Krampus is, though. They rather looked to be enjoying it! I think the Krampuses were not so evil after all. I forgive them for swiping my ankles with whips and bundles of sticks. And I appreciate them leaving my hair alone for the most part. And for posing so dramatically for my camera. They are scheduled to make another run next Sunday, so I’d be glad to take you down to the square so they could take their best shot at you! Any takers? ?